Synecdoche is a type of metonymy founded on the relation of a whole to its parts. 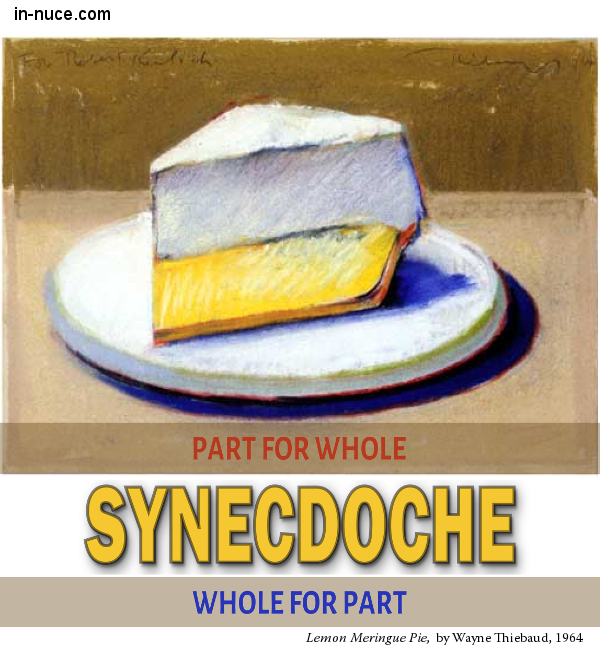 There are various forms of synecdoche, answering to the different kinds of wholes and parts. A. Species is put for the genus, an individual for species. For instance, bread for food; silver and gold for riches. “They shall beat their swords into plowshares, and their spears into pruning-hooks,”—swords and spears are here used for all weapons of war, plowshares and pruning-hooks for the implements of the peaceful arts; a Homer, instead of an epic poet; a Demosthenes, instead of an orator. For instance, a Solomon, for a wise man; a Judas, for a traitor. In introducing new ones care must be taken that their application be instantly recognized. B. A quality or attribute of an individual object or person is put for the individual. “Thus spoke the tempter”; “the philosopher” for Aristotle. Although seemingly substituting the general for the particular, it really presents the individual with some prominent characteristic, and thus makes the notion more distinct. C. The matter of an object is put for the form. Likewise, steel for sword, lead for bullet. The object is thus presented more vividly by suggesting some of its visible aspects. D. A part of an integrate whole is given instead of the whole. E. A lesser is used for a greater. What is abstract and general is conveyed by means of particular and individual notions that can be pictured in the imagination. a. Most appropriate are those prominent characteristic parts which suggest most naturally and readily the entire object. b. A part only should be chosen which is appropriate to the idea and purpose of the writer, and corresponds to what is said of the whole which it represents. a vessel for a ship; a creature for a man. To substitute the more general is less common than substituting the specific for general. This is because the effect is less dynamic unless the generic name has a peculiar expressiveness. This Cicero tells Brutus, when he intends only himself. The case of putting the abstract for the concrete is, like the general for the specific, an exception. Youth, beauty, may sometimes stand for the young, the beautiful; the figurative effect lies in isolating, as it were, the main quality, and thus giving it greater prominence.